The market nets another day of gains, with every single cryptocurrency in the top ten, along with the vast majority in the top 100, citing gains; some of which stretch well into the high 10s as well as a few up 20%+ in just 24 hours. Right now Bitcoin Cash leads the pack, Litecoin just surpassed yesterday’s peak, and Bitcoin is back over $5000! 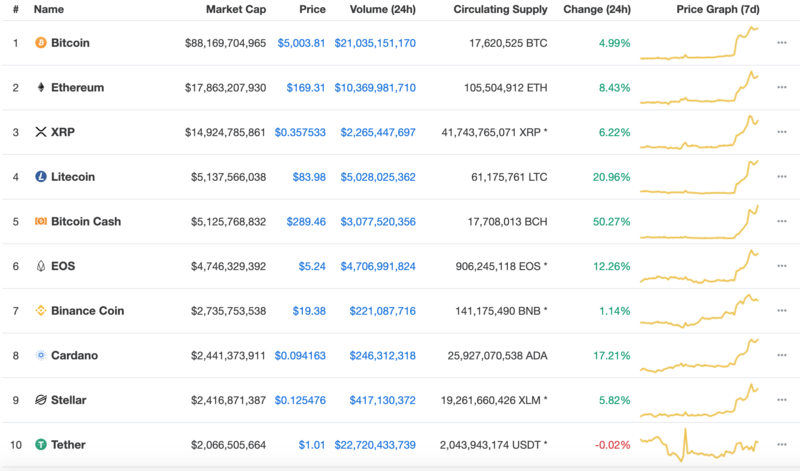 A look at the top ten depicts a sight not seen in well over a year, with Bitcoin Cash (BCH) leading the pack up 50.27% in the past 24 hours, followed by Litecoin (LTC) citing an impressive continued rally and a 20.96% rise, currently at $83.98 surpassing yesterdays peak of $83.06. Bitcoin (BTC) is currently testing levels above $5k up 4.99% in 24 hours, with hopes pinned that it can overcome resistance at this level and continue onto $6K where the real test will begin. Cardano (ADA) and EOS are also citing impressive runs, respectively up 17.21% and 12.26% on the 24-hour charts. Meanwhile, Ethereum (ETH), XRP, Binance Coin (BNB), and Stellar (XLM) are all citing increases of 8.43%, 6.22%, 1.14%, and 5.82%, respectively. Outside of the top ten is much the same story with BCH counterpart and rival Bitcoin SV (BSV) up 24.55%. And taking it all the way to the bank is Elon Musk’s new favorite altcoin, Dogecoin (DOGE) which, thanks in part to Musk has gained a massive 32.20% in the past 24 hours. One of the only coins in the top 100 citing drastic losses is Maximine Coin (MXM) which is down -36% in the past 24 hours.